﻿ Low-intensity cardio or high-intensity cardio? In a simple arithmetic everyone can estimate that low-intensity cardio is longer and has more energy consumption for the time and performance. It is so, but the advantage of HIT is that it works in two directions. In one side – stimulates muscle tissues responsible for muscle growth and at the same time stimulates significantly the metabolism within 48 hours after the workout. 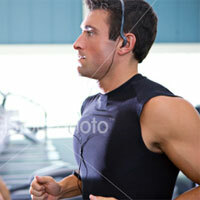 In comparison – low-intensity cardio workout stimulates the metabolism only during the workout. Few minutes after you finish your metabolism returns to the old level – before the workout. High-intensity cardio (HIT) is 75-85% of the maximum pulse (calculate by the formula: Maximum pulse=220 minus the age). This is usually performed in short intervals – 20-30 minutes and performed in the form of high speed or sprint intervals followed by low speed intervals. High-intensity cardio workout is preferred to low-intensity except in some specific cases. For example, your body weight is high for the musculoskeletal system, then the joints can be loaded significantly and it is advised to perform low-intensity cardio until the weight is in the norm. If the fat percentage in men is below 18% and in women below 20% then you can do HIT.